I hope today’s soup recipe warms your heart and soul as much as it does mine. But before I go into all the delicious details about this Tomato-Basil soup recipe, I must confess this time of year is my FAVORITE season. I absolutely love fall! The cooler weather, vibrant colors of leaves changing, cozy blankets, and tasty comfort foods make me oh so happy! 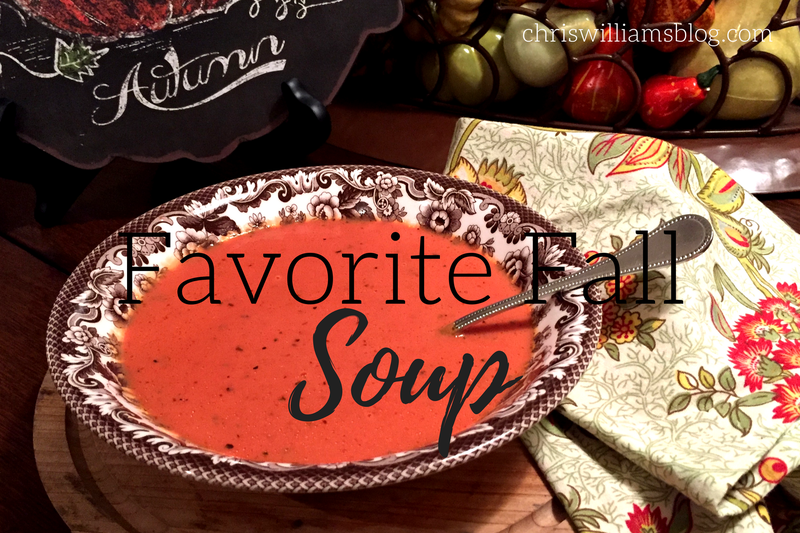 Today’s delicious soup recipe is a perfect compliment to this bountiful season. Its rich color and creamy flavor will surely delight all your senses. Whether serving it with quiche for a luncheon, grilled cheese sandwiches, pasta, or grilled chicken- this soup is beyond easy to make and very family friendly. The hint of garlic paired with basil, butter, whipping cream, and tomatoes effortlessly fuses together to make one robust and wonderfully aromatic soup. Combine tomatoes and juice in a large saucepan. Simmer for 30 minutes over medium to low heat. Remove from heat and cool slightly. Use hand immersion mixer to blend to desired consistency. Add butter and cream. Stir until blended. Add salt, garlic powder and pepper. If too acidic for your taste buds, try adding a pinch of sugar. Mmmm… this sounds so so good, Chris! Thank you for sharing this recipe! Well, I stopped by for a different post, but I am hanging out here for this soup! Yum-uh. Pinning immediately.